Your iOS devices are nothing without waves. Waves are the food for every mobile device connected to the internet or your carrier and contain the information e.g. needed for your browser to show websites and for a phone call to transmit your voice. But what are waves and how does this work? You all know water waves, seismic waves and waves that transmit the sound from one person to another or from speakers to your ear. Sometimes sound waves contain good news or bad news. Whatever is transmitted by waves it’s always INFORMATION. In case of iPhones contacting your carrier or iPads contacting your wireless access point, waves are Electromagnetic Waves. In contrast to water waves (propagating through water), the sound (propagating through gas) and seismic waves (propagating through the earth) electromagnetic waves don’t need a medium. They also can carry information while propagating through the vacuum with the speed of light (about 300.000 m/sec). That’s pretty fast and helps when transmitting information to your device because there are many disturbers around us and so information has to be transmitted several times before being identified as those destined for you. Properties of waves are among others the amplitude (height of cycles) and the frequency (number of cycles per second). Sound waves have a low frequency when we hear a deep tone. The frequency is measured in Hertz (Hz). Image (1) shows an AM (amplitude modulated) wave and Image (2) an FM (frequency modulated) wave. You all know AM and FM if you ever looked on a radio’s dashboard. The more important method is to transmit information with a frequency modulated wave. A constantly moving wave with the same frequency and amplitude cannot transmit information except a YES (the sender is on) or a NO (the sender is off). To transmit information we have to vary the amplitude or frequency of the electromagnetic wave. But the information then is encoded and none of our organs of perception can understand what it means. iPhone’s receivers for WiFi and carrier-based signals support us by converting the electromagnetic waves hitting the device into text, pictures and sound. For example, a radio transmitter turns a human voice into waves by varying the frequency of waves in the same pattern as the sound waves measured by a microphone. Image (2) shows a FM wave where the frequency is varied constantly. If it represents a sound wave it could be the varying signal of an ambulance and provides us with the information ‘Let it pass’. Your WiFi is not working? As I already mentioned there are many disturbers preventing us from enjoying our iPhone. If you have problems with your WiFi connection a possible reason could be INTERFERENCE. 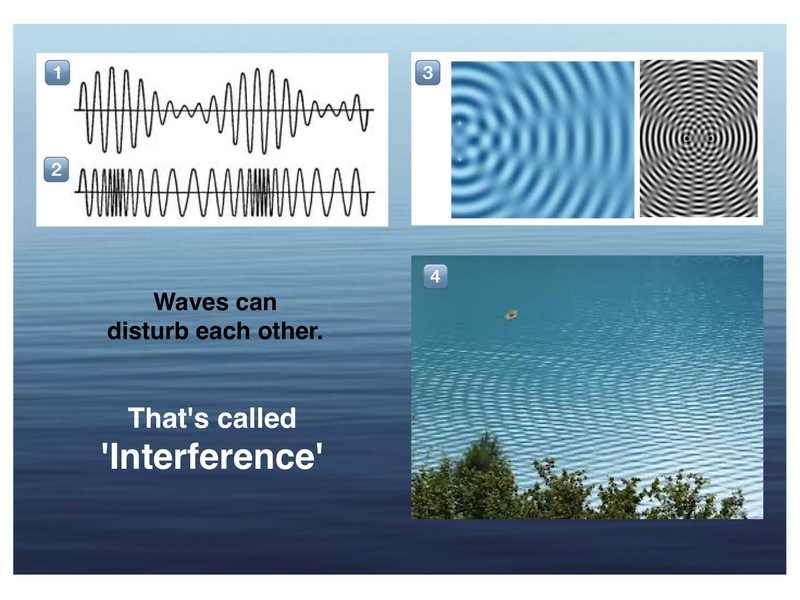 Interference occurs if waves carrying the information disturb each other. In one case the disturbance may lead to a complete extinction so that your device looses the connection to the access point. Images (3) shows two senders not far apart. Two pins, driven by an electromotor, are tapping on the water and in some regions you can see quietness. The water waves are extinguished. Image (4) shows this phenomenon in the nature. That’s what can happen with your WiFi access point while providing your iPhone with information via electromagnetic waves. One of the most common causes of a low Wi-Fi signal is distance. Wireless routers and access points are limited to low-power broadcasts to prevent interference with other equipment, limiting their effective range to around 100 feet indoors. If your Wi-Fi signal mysteriously drops off in certain rooms, it may be due to your home’s construction. Especially thick walls and a metallic mesh inside the wall effectively disrupt any Wi-Fi signal passing through, significantly reducing signal strength or blocking the signal completely. You may also find intermittent signal problems caused by interference from other, non-Wi-Fi devices. Wi-Fi operates in the 2.4-gigahertz band, as do cordless phones, some remote alarm products and a microwave oven. When active, these devices can reduce your Wi-Fi signal strength due to interference. Additionally, microwaves can produce substantial interference in the frequency range used by wireless devices and can completely disrupt a Wi-Fi connection. Taking care to situate your wireless nodes and equipment away from such interference can help improve signal strength, but repeated problems may require you to replace older appliances with modern, wireless-friendly alternatives or switch to the 5-gigahertz frequency band available with 802.11n products. Another source of Wi-Fi signal problems is interference. Wireless devices feature the ability to transmit and receive on several separate channels (slightly different frequencies in the 2.4 or 5 GHz band), but in many cases, they shift from the factory set to a single default channel. This can mean that several wireless sources in a small area, such as an apartment building, are all competing for signal in the same frequency band. If you encounter unexpectedly weak Wi-Fi signals and detect other networks operating in your area, try switching to different channels to find a less crowded part of the spectrum. You can change the channel for your Apple router using the free Airport Utility provided by Apple. Thanks for surfing by on your wave.